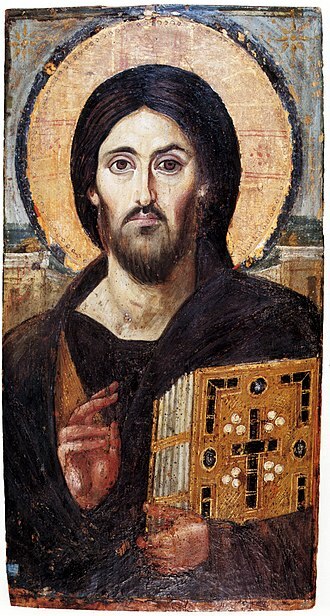 In 1340 Simeon, the eldest son of Ivan Kalita, was stationed in Nizhny Novgorod. 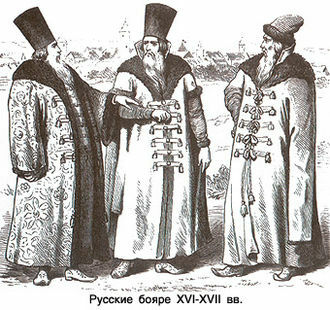 Upon receiving news of his father death, Simeon and his brothers Andrey and Ivan left for the Golden Horde to seek Uzbeg Khan's patent (yarlyk) for taking over the title of Grand Prince. 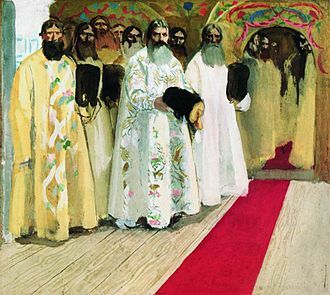 Rivals Konstantin of Tver and Konstantin of Suzdal also paid their homage to the Khan, claiming seniority over Moscow princes. 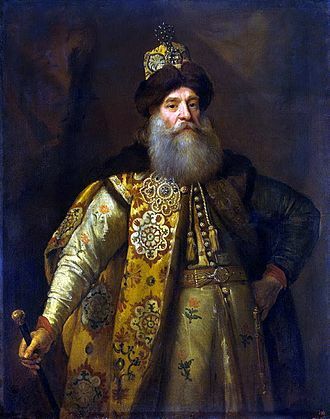 Simeon won the patent through bribing the Khan's retinue; princes of Tver and Suzdal had to agree to his seniority; Uzbeq also extended his benevolence to Simeon's issue. 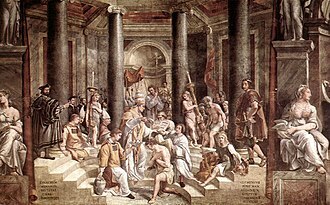 He was also granted the ceremonial title epi trapezes offikios (Greek: ό επί τραπέζης όφφίκιος) by the Byzantine Empire, which can be loosely translated as seneschal or stolnik. In the same 1340 Simeon engaged in his first military standoff with Veliky Novgorod. Simeon claimed his right to collect taxes in the Novgorodian town of Torzhok. Torzhok boyars locked up Simeon's tax collectors and called for help from Novgorod. Simeon and metropolitan Theognostus hastily organized a coalition of princes against Novgorod, claiming that "They [Novgorodians] make war and peace with whomever they please, consulting no one. Novgorod regards not all Russia, and will not obey her Grand Prince", referring to Novgorod incursions into Ustyuzhna and Beloe Ozero. As the coalition forces approached Novgorodian lands, the people of Torzhok revolted against the boyars and sided with Muscovite troops. Novgorod Republic accepted the fact and ceded all taxes from Torzhok area, estimated at 1,000 roubled in silver annually, to Simeon who agreed to honor the existing civic charter. In 1341, shortly after the dismissal of muscovite coalition army, Algirdas (then prince of Vitebsk, allied with prince of Smolensk) besieged Mozhaysk. 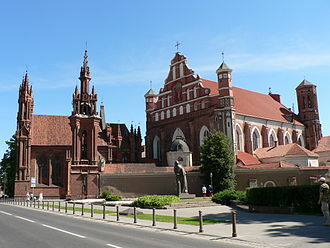 News of the death of Gediminas forced Algirdas to quit the campaign before Simeon could arrange a military response. Uzbeg Khan, Simeon's sovereign, died soon afterwards; his successor, Jani Beg, secured the control of the Horde through killing his brothers. Simeon and Theognostus had to travel to the Horde again. 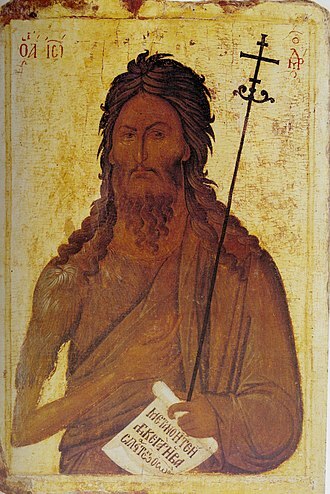 Jani Beg reassured Simeon in his rights and let him go, but kept Theognostus hostage to extort money from the church; eventually, Theognostus was released for 600 roubles. 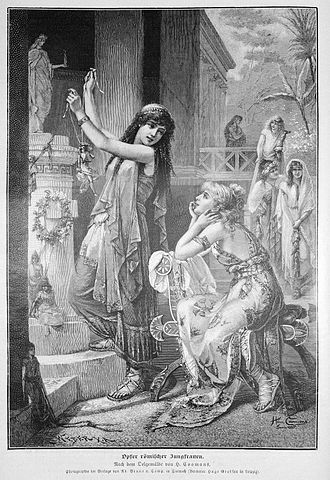 In 1333, Simeon married Aigusta (Anastasia), sister of Algirdas. 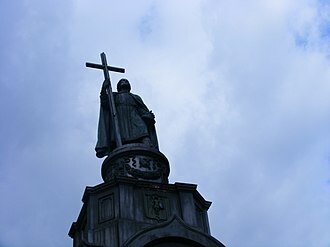 After her death in 1345, Simeon married Eupraxia of Smolensk, but soon sent her back to her family, claiming that Eupraxia was cursed since wedding and "appears to be dead each night". Eupraxia remarried Prince Fominsky, and Simeon married Maria of Tver; their four sons died in infancy. Throughout the 1340s Lithuanian and Swedish military campaigns and internal political disarray decreased the influence of the Novgorod Republic. Simeon, whose title of Grand Prince obliged him to protect Novgorod, was reluctant to do so, as if expecting the weakened republic to collapse for his own benefit. 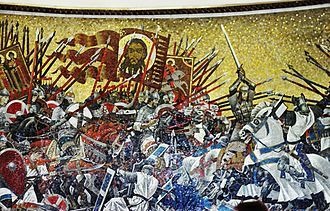 In 1347, when Novgorodians called for help against the Swedes, Simeon dispatched his brother Ivan and Constantine of Rostov; the envoys refused to fight for the Novgorodians. 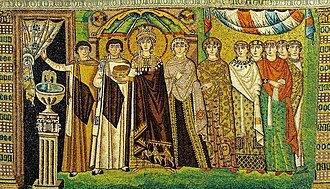 Simeon himself was busy with offsetting the Lithuanians' influence in the Horde, meanwhile harboring two renegade Lithuanian princes as potential claimants to the Lithuanian crown. He manipulated Jani Beg into believing that increasing Lithuanian influence became the most important threat to the Horde. Jani Beg eventually concurred with Simeon's envoys (of Mongolian ethnicity) and extradited Lithuanian envoys to Simeon's mercy. 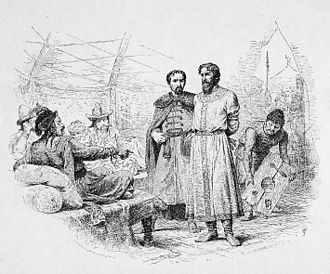 Simeon preferred to sign a truce with Algirdas, releasing the prisoners and securing marriages between Lithuanian princes and Russian brides. 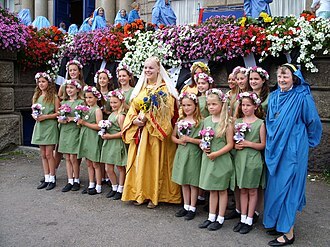 The marriage of pagan Algirdas to Orthodox Uliana of Tver, unlawful from the viewpoint of the church, was nevertheless approved by Theognostus; it gave birth to Jogaila. In 1351–1352 Simeon raised arms against Algirdas over control of small towns in Smolensk area. This conflict, again, did not develop into an open war as Algirdas preferred negotiations to fighting. Although the first round of talks was broken by Lithuanians, Simeon secured the disputed towns for Moscow. This campaign was his last act of Simeon's life. The Black Death was recorded in present-day southern Russia and Ukraine as early as 1346. It hit Scandinavia in 1349, Pskov in the beginning of 1352 and Novgorod in August 1352; by the end of the year two thirds of Pskov were reported dead. The same pattern repeated in Lithuania and north-eastern Russia. In 1353 plague arrived in Moscow, killing Theognostus, Simeon, his two sons and his brother Andrey who survived Simeon by six weeks. Before his death in 1353, Simeon took monastic vows and took the name of Sozont. He installed Alexis as Metropolitan of Moscow, successor to the late Theognostus, and secured a profitable estate for Maria. Simeon’s will is considered to be the first usage of paper in Russia, as parchment was used previously. Simeon is buried in the Archangel Cathedral of the Moscow Kremlin. 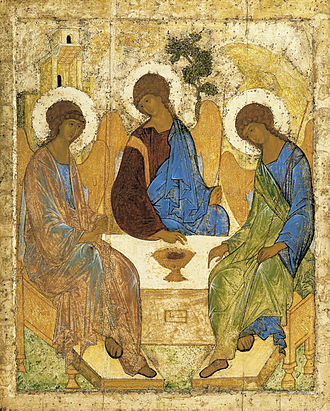 ^ a b Basil Dmytryshyn, Medieval Russia:A source book, 850-1700, (Academic International Press, 2000), 193. Curtin, Jeremiah (2002). The Mongols in Russia. Adamant Media Corporation. ISBN 9781402100307. Mouravieff, A. N. (2004). A History of the Church of Russia. Kessinger Publishing. ISBN 9781417912506. Tver is a city and the administrative center of Tver Oblast, Russia. It is situated at the confluence of the Volga and Tvertsa Rivers, the city was known as Kalinin from 1931 to 1990. Tver’s foundation year is accepted to be 1135, although there is no universal agreement on this date. 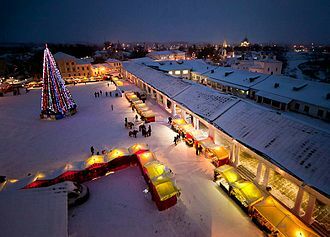 Originally a minor settlement of Novgorodian traders, it passed to the Grand Prince of Vladimir in 1209, in 1246, Alexander Nevsky granted it to his younger brother Yaroslav Yaroslavich, from whom a dynasty of local princes descended. Four of them were killed by the Golden Horde and were proclaimed saints by the Russian Orthodox church, formerly a land of woods and bogs, the Principality of Tver was quickly transformed into one of the richest and most populous Russian states. 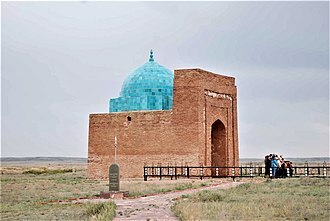 As the area was accessible for Tatar raids, there was a great influx of population from the recently devastated south. By the end of the century, it was ready to vie with Moscow for supremacy in Russia, both Tver and Moscow were young cities, so the outcome of their rivalry was far from being certain. Mikhail, the Grand Prince of Tver, who ascended the throne of Vladimir in 1305, was one of the most beloved of medieval Russian rulers and his policy of open conflict with the Golden Horde led to his assassination there in 1318. His son Dmitry the Terrible Eyes succeeded him, concluding an alliance with the mighty Grand Duchy of Lithuania, exasperated by Dmitrys influence, Prince Ivan Kalita of the Grand Duchy of Moscow engineered his murder by the Mongols in 1326. On hearing the news of crime, the city revolted against the Horde. The Horde joined its forces with Muscovites and brutally repressed the rebellion, many citizens were killed, enslaved or deported. This was the blow to Tver’s aspirations for supremacy in Russia. In the second half of the 14th century, Tver was further weakened by struggles between its princes. Two senior branches of the house, those of Kashin and Kholmsky. The claimers were backed up by Moscow and eventually settled at the Moscow Kremlin court, during the Great Feudal War in the Grand Duchy of Moscow, Tver once again rose to prominence and concluded defensive alliances with Lithuania, Novgorod and the Golden Horde. Jani Beg called Djanibek Khan was a khan of the Golden Horde from 1342 to 1357, succeeding his father Öz Beg Khan. After putting two of his brothers to death, Jani Beg crowned himself in Saray-Jük and he is known to have actively interfered in the affairs of Russian principalities and of Lithuania. The Grand Princes of Moscow, Simeon Gordiy, and Ivan II, were constant political. Jani Beg commanded a massive Crimean Tatar force that attacked the Crimean port city of Kaffa in 1343, the siege was lifted by an Italian relief force in February. In 1345 Jani Beg again besieged Kaffa, his assault was unsuccessful due to an outbreak of the Black Plague among his troops. It is thought that Jani Begs army catapulted infected corpses into Kaffa in an attempt to use the Black Death to weaken the defenders, infected Genoese sailors subsequently sailed from Kaffa to Genoa, introducing the Black Death into Europe. In 1356 Jani Beg conducted a campaign in Azerbaijan and conquered the city of Tabriz. He asserted Jochid dominance over the Chagatai Khanate, attempting to unite the three khanates of the Mongol Empire, after accepting surrender from Shaikh Uvais, Janibeg boasted that three uluses of the Mongol Empire were under his control. 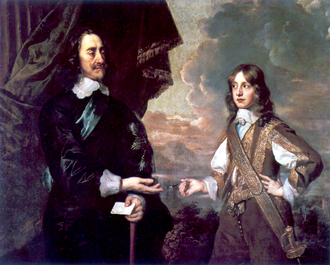 The Grand Duke of Vladimir was a prince during the Kievan Rus and after its collapse. He ruled territory approximately bounded by the Volga and Northern Dvina rivers and its capital was Vladimir during 1157-1238. Vladimir city was founded by a Kievan prince Vladimir Monomakh in 1108 and was destroyed by a Mongol invasion in 1238, the second important city was Suzdal, destroyed by Mongols. 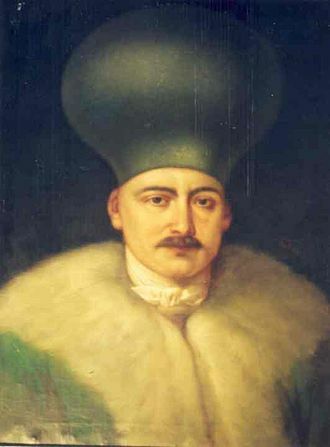 The Grand Duke Yuri Dolgorukii, the son of Vladimir Monomakh. Vladimir-Suzdal began the consolidation of Russian lands, completed by Muscovy. Vladimir was founded in the 12th century, the principality was overrun by the Mongols under Batu Khan in 1242. 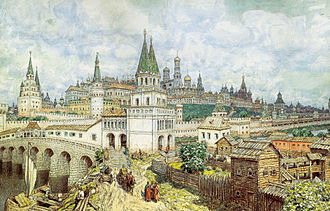 He and his successors asserted suzerainty over it until 1328, during this period, Vladimir became the chief town of the Russian settlements in the basin of the Oka and it clashed with the new principality of Moscow, to which it finally succumbed in 1328. 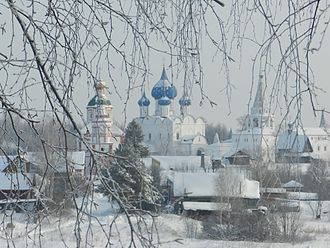 It began to decay in the 14th century, Vladimir-Suzdal is perceived as a cradle of the Great Russian language and nationality and gradually evolved into the Grand Duchy of Moscow. 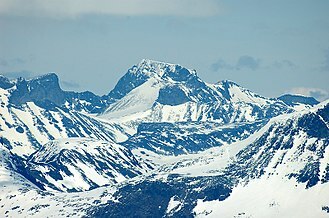 Known as Beloozero until 1777, it was first chronicled in 862 as one of the five original Russian towns. According to the Primary Chronicle, Sineus, a brother of Rurik, Sineus most likely never existed. On several occasions, the settlement was moved from one bank of the lake to another, in the 11th century, the region was still inhabited primarily by Finno-Ugric tribes who fiercely resisted Christianization. In 1071, local pagan priests rose in rebellion, which was put down by the Kievan commander Yan Vyshatich, the Primary Chronicle reports that the dead bodies of priests were suspended from an oak tree, until they were torn to pieces by a bear. From the 10th to the 13th centuries, the territory was controlled by the Novgorod Republic, Beloozero was the seat of a small principality between 1238 and the 1370s, but subsequently between 1380 and 1384 became subordinate to the Grand Duchy of Moscow. On July 10,1612, Polish and Lithuanian vagabonds captured Belozersk without a fight, in the course of the administrative reform carried out in 1708 by Peter the Great, Beloozero was included into Ingermanland Governorate and named one of the towns constituting the governorate. In 1727, a separate Novgorod Governorate was split off and Belozersk became the seat of Belozersk Province in Novgorod Governorate, in 1776, the territory was transferred to Novgorod Viceroyalty. In 1796, the viceroyalty was abolished and Belozersky Uyezd became a part of Novgorod Governorate, in June 1918, five uyezds of Novgorod Governorate, including Belozersky Uyezd, were split off to form Cherepovets Governorate, with the administrative center in Cherepovets. On August 1,1927, Cherepovets Governorate was abolished and its territory became Cherepovets Okrug of Leningrad Oblast, at the same time, uyezds were abolished and Belozersky District was established. On September 23,1937, Belozersky District was transferred to newly established Vologda Oblast, within the framework of administrative divisions, Belozersk serves as the administrative center of Belozersky District. As an administrative division, it is incorporated within Belozersky District as the town of significance of Belozersk. Belozersk falls just within the subarctic climate range, with the fourth-warmest month being just below the isotherm of 10 °C to nearby humid continental areas, winters are cold but not severe by Russian standards for areas north of the 60th parallel. Parchment is a writing material made from specially prepared untanned skins of animals—primarily sheep and goats. 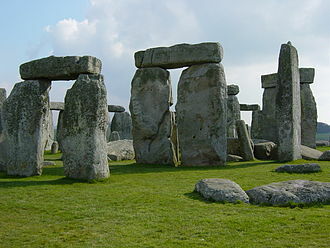 It has been used as a medium for over two millennia. Vellum is a finer quality parchment made from the skins of kids, lambs and it may be called animal membrane by libraries and museums that wish to avoid distinguishing between parchment and the more restricted term vellum. 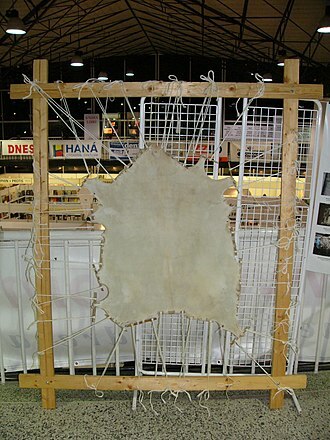 Today the term parchment is often used in non-technical contexts to refer to any animal skin, particularly goat, sheep or cow, that has been scraped or dried under tension. Vellum in theory refers exclusively to calfskin, and is used to denote a quality of material. 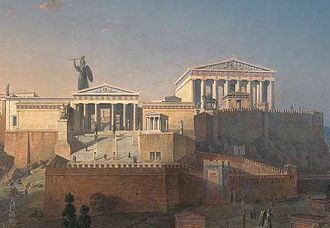 The term parchment originally referred only to the skin of sheep and, the word parchment evolved from the name of the city of Pergamon which was a thriving center of parchment production during the Hellenistic period. This account, originated in the writings of Pliny the Elder, is dubious because parchment had been in use in Anatolia, in the 2nd century BC a great library was set up in Pergamon that rivaled the famous Library of Alexandria. Writing on prepared animal skins had a history, however. H. Ibscher, and preserved in the Cairo Museum, a roll of the Twelfth Dynasty now in Berlin, the text now in the British Museum. Though the Assyrians and the Babylonians impressed their cuneiform on clay tablets, early Islamic texts are found on parchment. In the Middle Ages, especially the 15th century, parchment was largely replaced by paper for most uses except luxury manuscripts, new techniques in paper milling allowed it to be much cheaper than parchment, it was still made of textile rags and of very high quality. With the advent of printing in the fifteenth century, the demands of printers far exceeded the supply of animal skins for parchment. Although most copies of the Gutenberg Bible are on paper, some were printed on parchment,12 of the 48 surviving copies, in 1490, Johannes Trithemius preferred the older methods, because handwriting placed on parchment will be able to endure a thousand years. But how long will printing last, which is dependent on paper and it lasts for two hundred years that is a long time. 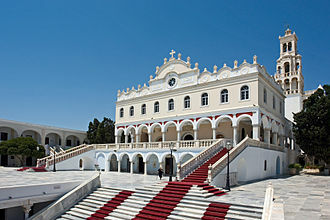 The Cathedral of the Archangel is a Russian Orthodox church dedicated to the Archangel Michael. 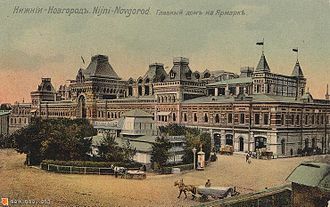 It is located in Cathedral Square of the Moscow Kremlin in Russia between the Great Kremlin Palace and the Ivan the Great Bell Tower and it was the main necropolis of the Tsars of Russia until the relocation of the capital to St. Petersburg. 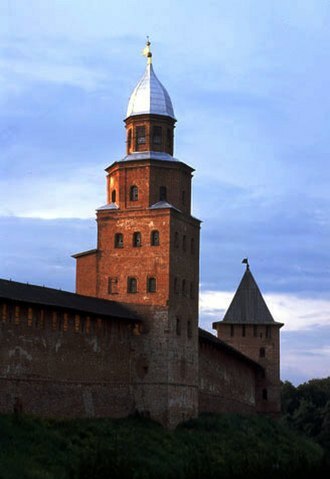 It was constructed between 1505 and 1508 under the supervision of an Italian architect Aloisio the New on the spot of an older cathedral, an Italian, Lamberti Aloisio da Mantagnana was invited to Moscow, and ground was broken for a new cathedral on 21 May 1505. Ivan died in the autumn of the year, and was buried in the still unfinished building. Work on the cathedral was completed by the end of 1508, the new building incorporated many elements of the Italian Renaissance, and numerous of these details disappeared during repairs and restorations. The interior walls were not painted with frescoes until the 1560s, victories of the Russian military were celebrated in the Cathedral of the Archangel. All Russian tsars and grand princes were buried within the cathedral until the time of Peter the Great, along with many empresses and princes of the blood, with the sole exception of Boris Godunov. After the royal necropolis was moved to Peter and Paul Cathedral in St. Petersburg, only Tsar Peter II, there are 54 burials in the cathedral, with 46 ornamented whitestone tombstones and glazed cases made of bronze. Of note is the tomb of Tsarevich Demetrius, the son of Ivan the Terrible, was buried there in the early 17th century and was canonized, during the 1917 Russian Revolution, the cathedral was damaged during the fighting. Afterwards, it was closed by the Bolshevik regime, during the 1950s, along with the other surviving churches in the Moscow Kremlin, was preserved as a museum. A large portion of the treasures were either transferred to the Kremlin Armory Museum. 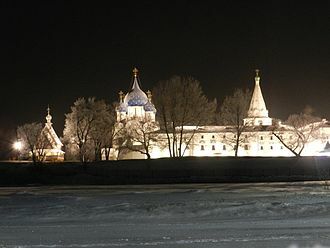 After 1992, the building was returned to the Russian Orthodox Church, compared with the other two major Kremlin cathedrals, the Archangel Cathedral is substantially different in style, despite maintaining a traditional layout. 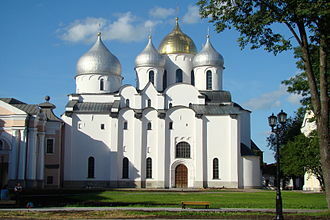 Assumption Cathedral in Vladimir was built in 1158-60 and functioned as the mother church of Russia in the 13th century.